"The easiest amps to listen to -- on all types of music -- that I've had in my system." Sound "A self-effacing transparency, an overall lack of an electronic character, that makes these amps satisfying with all kinds of music," along with "a complete lack of grit and grain, even the fine dust that many exceptional amps exhibit." "Their tone is rich and their imaging physical, yet they don't achieve this at the cost of resolving power." "The BC208s are modest amps, leaving the showiness for the music they play." Features Hybrid 215W mono amps that use "power op-amps designed for industrial and aerospace applications in the place of more traditional solid-state output devices." "Each BC208 uses four output modules, which consist of two op-amps and a circuit board mounted on their own heatsink, for a total of eight for both channels." Use "I preferred the BC208 balanced, and recommend that the amp be used this way. It sounded too demure for my tastes single ended." "Placing the BC208s in my large listening room proved to be a challenge because they are nearly three feet deep." Value "Even among amps in their penthouse price range, the BC208s stand out for their particular kind of realism." Gilbert Yeung, the designer of all Blue Circle products and the maker of a number of them as well, is an offbeat yet logical guy, what people of my parents' generation call "a straight shooter." For example, we recently talked about the CES change of venues for high-end audio in 2007, from the Alexis Park to the Venetian. Along with this change is a price increase of over $1000 for the smallest rooms. It seems clear that the Consumer Electronics Association, which puts on the CES, views high-end audio as a nuisance. In the CEA's view, all of the other CES exhibitors subsidize high-end audio's existence at the largest consumer-electronics trade show in the world. "So I'm not going," Gilbert announced. "Not going to CES? Why?" I asked. "Because I don't want to accept a handout." As I said, Gilbert is logical, which makes the existence of his BC208 monoblocks all the more perplexing. Here are mono amps, the most elaborate and costly that Gilbert has ever made, that seem very illogical. They are big, powerful, big, heavy, and big. They are as deep as some floorstanding speakers are tall, and their fully balanced circuit makes their handmade nature seem all the more impressive. "They're ridiculous," I told Gilbert after I lugged them into my listening room, tweaking my back in the process. "You're going to put that in the review, aren't you?" he asked. "Yeah, I'll put it in there. It's true." "Good," he said without a hint of irony. I am not unfamiliar with Blue Circle's BC200-series amplifiers. Last summer, I reviewed the BC204 stereo amp ($8495 USD), a mere two weeks after we published Jason Thorpe's review of the BC202 ($5795). The BC200 series was introduced roughly two years ago, but the BC208 ($24,495 per pair) is the newest amp in it, having debuted earlier this year at CES. There is also a BC206 stereo amp ($11,295), which is identical in size to a BC208. The rated power outputs of the BC200-series amps are not all that different from each other: 125Wpc for the BC202, 150Wpc for the BC204, 180Wpc for the BC206, and 215W for the BC208. As Gilbert pointed out to me for my earlier review, "I'm not selling watts. The differences are in refinement." All of the BC200-series amps are fully balanced designs, but their tube input stage, which uses four 6922s, is wired so that when you use the RCA jacks, it is a true single-ended circuit. However, through the XLR jacks, the circuit is balanced and the sound is different. One of the most important "refinements" of the BC208 involves that input circuit, which is biased slightly differently for the BC208 than for the BC202 or BC204. Even so, as I found with the BC204, I preferred the BC208 balanced, and recommend that the amp be used this way. It sounded too polite for my tastes single ended. All BC200 amps use power op-amps designed for industrial and aerospace applications in the place of more traditional solid-state output devices. Gilbert chose these because they are able to drive very complex loads, including loudspeakers. Each BC208 uses four output modules, which consist of two op-amps and a circuit board mounted on their own heatsink, for a total of eight for both channels. 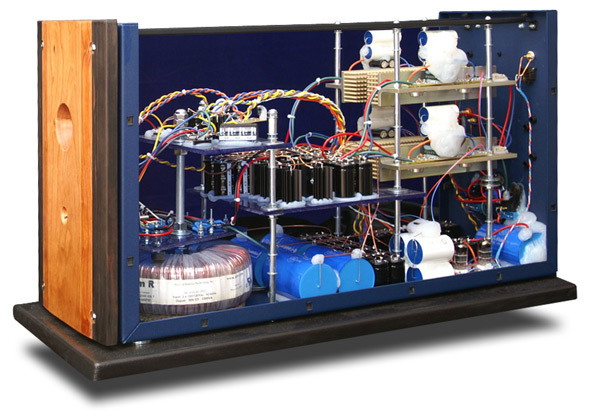 The BC202 uses two modules, the BC204 three, and the BC206 three. The power supply for the mono BC208 is the same as that for the stereo BC206, a whopping 1300VA number. Total capacitance is 600,000uF per channel. The BC208 measures 13"W x 18 1/8"H x 31 3/4"D and weighs a ridiculous 130 pounds. There are no handles, so picking up a BC208 is a job for two strong men with good backs. I moved the amps around my listening room on furniture sliders. The amps are packed in multiple heavy cardboard boxes with an abundance of protective foam around them. You can't ship these amps with Fedex or UPS, but I suspect they would make the trip without damage if you could. I picked the amps up following CES earlier this year. On the way home, I was stopped and searched before going over Hoover Dam because of the two enormous boxes in the back of my van. Like many Blue Circle products, much of the BC208 is component-to-component wired, which adds serious time to their manufacture. Gilbert built the review pair of amps in his dining room over the course of several months leading up to CES. On the front of the amp are the power switch and requisite glowing Blue Circle logo, and around back are the RCA and XLR inputs, two sets of speaker binding posts, and a 20A Neutrik twist-lock connector for the Blue Circle BC68 power cord that comes with the amp. There is also a ground-lift switch that disconnects only the signal ground for safety. All of the BC200-series amps are available in a huge array of finish combinations -- just about any you can imagine. Prices can be steep, however, because you have to outfit two amps. In Blue Circle's classic stainless-steel dress, the BC208s cost an additional $2200; Gilbert also has options that cost as much as $5000. 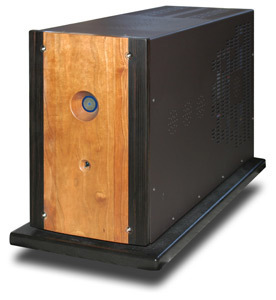 In standard form, the BC208's faceplate and bottom platform are made of MDF, and its outer case is 12-gauge steel. Placing the BC208s in my large listening room proved to be a challenge because they are nearly three feet deep. Even with the massive Wilson Audio Alexandria X-2s, the BC208s jutted past the front of the speakers when placed front to back nearby. With the smaller Sophia Series 2s, the amps blocked the speakers considerably. Of course, solving this problem was easy by simply facing the sides of the amps outward, although this didn't exactly look good. If your audio system is configured unlike mine, which has the amps and equipment rack between and behind the speakers, you probably won't encounter placement problems with the BC208s. As mentioned, I used Wilson Audio Alexandrias and Sophia 2s with the BC208s. Near the end of my time with the amps, a pair of Magnepan MG20.1/Rs also showed up. Preamps in use most of the time were two rather different-sounding Reviewers' Choice units: an Audio Research Reference 3 and Einstein's The Tube. Other amps on hand were Lamm M1.2 Reference hybrid and ML2.1 SET monoblocks. Sources were all digital: Esoteric X-01 Limited and P-03/D-03 combo, both of which play CDs and SACDs; Audio Research Reference CD7 CD player; and Ayre C-5xe stereo universal player. All of the Lamm amps sat on Silent Running Audio Ohio Class XL Plus2 equipment platforms, while a four-shelf Silent Running Craz Reference isoRack Plus supported the rest of the electronics. Interconnects and speaker cables were from AudioQuest (Sky and Volcano), Shunyata Research (Antares Helix and Orion Helix), and Siltech (SQ-110 Classic Mk II and LS-188 Classic Mk II). As mentioned, power cords for the Blue Circle amps were those that came with the amps, while a number of Shunyata Research cords brought juice to the other electronics. These included Anaconda Helix and Python Helix in both Vx and Alpha variations. A Shunyata Research Hydra Model-8 did the power conditioning. To use along with the BC208s, Gilbert also loaned me a fully balanced BC3000 Mk II preamp with beefy GZpz power supply. This turned out to be a great match with the amps both sonically and in terms of gain. Gilbert designs his amps with rather low voltage gain, which results in lower overall system noise. It also allows users to get further into the rotation of the volume control of his preamps, where the sound is best. While I missed the remote-controlled convenience of the ARC Reference 3, I loved the sound of the BC3000 Mk II GZpz. If we don't review it on SoundStage! or Ultra Audio at some point in the near future, it will be due to Gilbert's not supplying it! Because I had heard the BC202 and BC204, I was somewhat prepared for the BC208s' introduction into my system. Indeed, as I first sat down to listen, I identified only the mono amps' obvious sense of power as an area in which the BC208s were significantly better than their stereo counterparts. This gave the amps ease and authority, both dynamically and in terms of sheer output level, that the BC202 or BC204 couldn't match. However, even though none of the other differences between the amps stood out in similar fashion, the BC208s were significantly better amps. Their cumulative improvement -- in every meaningful way -- made this very apparent. The most prominent characteristic of the BC208s is also one on which it is difficult to put a label. It's a self-effacing transparency, an overall lack of an electronic character, that makes these amps satisfying with all kinds of music. I am not referring to a tubey warmth or smoothness here; the BC208s dismiss the old tubes-versus-solid-state debate because their sound doesn't have the earmarks of either of audio's dueling technologies. Instead, like that of the BC204, the BC208s' sound has a complete lack of grit and grain, even the fine dust that many exceptional amps exhibit. For some listeners, this will take some getting used to -- it's such a pervasive part of the at-home listening experience. Those who hear a lot of live music, however, will recognize it right off. One of my recent purchases is the Tord Gustavsen Trio's The Ground [ECM 000412302], a spacious- and slightly dry-sounding recording -- as many from ECM are. I love the pensive, intellectual nature of this music, which is sometimes referred to as "chamber jazz." With the BC208s driving the Wilson X-2s, the purity and full-bandwidth extension made listening to The Ground an event, the speakers and amps working together in fluid consonance (that's the best way I can describe it). If you hate the electronic haze of many amplifiers, the BC208s (and other BC200-series amps for that matter) will be a revelation. On the other hand, if you like an up-front, fast, blatantly exciting presentation, the BC208s are not for you. This doesn't mean that they sound slow, recessed and boring. Instead, their tone is rich and their imaging physical, yet they don't achieve this at the cost of resolving power. In fact, I was surprised at how well these amps revealed detail, especially the steeliness of guitar and the piercing blat of brass, which aren't conveyed through the chiseled edge definition of each note, but rather the intrinsic quality of effortless resolution. The BC208s are modest amps, leaving the showiness for the music they play. On my CES sampler I included a track from session drummer Jamie Oldaker's tribute to his Tulsa, Oklahoma musical roots, Mad Dog and Okies [Concord Music Group 2267]. Willis Alan Ramsey's "Sympathy for a Train" begins with some steel-stringed guitar to the right of center and the vocal dead center. When the piano enters to the left, you know that this isn't going to be an intimate singer-guitarist number -- the soundstage suddenly expands in all directions. The BC208s imbue this music with tremendous solidity amidst a soundstage that's as wide and deep as it can be. The amps convey space and fill it with meaty images that surprise because of their unadorned presence, not etched outlines or bloated warmth. Because of all their effortless power, the BC208s can pound out rock with the very best amps I've heard. From Beck to Jack Johnson, the BC208s portray the music with honest purity and muscle, never infecting it with a lean pallor. And as the volume goes up, the music simply gets louder, swelling in loudness the way that live music does but not showing the signs of strain that even very powerful amplifiers can. This led me to realize, after much listening, that the BC208s have some of the essential characteristics of life and thereby omit some of the worst characteristics of reproduction. While this last statement may sound like an audio-reviewer's platitude, I can think of no better way to describe the BC208s' sound and convey the way in which these amps are special. In fact, they remind me of the Zanden digital separates that we at SoundStage! have written about over the course of years and praised profusely. Their weight and presence, their tonal richness and lack of an electronic signature, are so perfectly mated to their inherent resolution that the music surpasses so much reproduction. There are many amps that sound warm and present, but also somewhat -- or very -- muffled and soft. You can also find similar resolution, but along with it comes crispy edge definition and high-frequency grain and hardness. Even among amps in their penthouse price range, the BC208s stand out for their particular kind of realism. I've used various Lamm amplifiers as my references for nearly a decade. Most recently, I've relied on the M1.2 Reference monoblocks ($21,690 per pair), which, like the BC208s, are hybrid amps that use a 6922 tube in their input stage. I've used the M1.2s for the truthful way they amplify the signals sent to them and the sheer beauty of the musical outcome. As I've maintained, the exceedingly rare combination of truth and beauty is what separates the very best audio equipment from lesser products and makes the M1.2 Reference amps a reviewer's dream component. That these amps also work well with my preamp of choice, the Audio Research Reference 3, is no small consideration either. Truth and beauty are also what the Blue Circle BC208s have in abundance, although with a few meaningful differences from the way in which the M1.2 References accomplish the same merging of sonic qualities. The Lamm hybrids sound more resolute and incisive because of their greater edge definition, and their bass is bigger and more billowy. They have a more assertive way of reproducing music -- projecting it with a greater sense of speed and vigor. In contrast, the sound of the BC208s has less of a character. Music simply pours out of them with more natural warmth and solidity, especially in the bass range, which sounds less prominent though just as forceful. Although both amps are hybrids, neither has an obvious solid-state tinge. Still, the BC208s sound more liquid and less insistent. In light of the BC208s, the M1.2 References lean more toward truth, which means that the BC208s fall more on the side of beauty. However, this isn't the sort of thing you notice unless you have these two amps to play off each other, so deft is their sonic balance. I'm not sure which one I would pick if I were starting from scratch. I'd like to think it would come down to ancillary equipment, so I would have something concrete on which to base my decision. In the end, I'd have to fall back on a variation of a well-worn reviewer's saying: I could be happy with either pair of amps, but I'd like to have enough money for both. When you know Gilbert Yeung and see his colossal BC208 amps for the first time, you begin to wonder what he was thinking. For the fortunate few who will get to hear these amps day after day, however, any incredulity will be overshadowed by the unassuming way they reproduce music. To my ears, the BC208s are perfect amplifying devices; they are easy to forget -- their sound seems tailored to create this reaction -- because they resemble what I hear from live music to a tremendous degree: no grain or grit, no electronic mist. There's a free-flowing way with all aspects of musical reproduction, and what serious listener wouldn't appreciate that? I've written about some of the best amplifiers on the planet, from the Lamm monoblocks I use as my reference to the wonderful Atma-Sphere MA-2 Mk II.3s. The Blue Circle BC208s are the finest pieces of audio equipment that I've heard from Gilbert Yeung; but more than this, they are the easiest amps to listen to -- on all types of music -- that I've had in my system. This feat alone puts them firmly in the company of the best amps I've heard, and makes them a Reviewers' Choice. Price: $24,995 USD per pair.